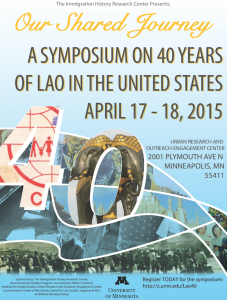 MINNEAPOLIS (March 18, 2014) — In April, over 100 Lao American scholars, artists and community builders will gather in Minneapolis for the first National Lao American Symposium and Writers Summit to reflect on 40 years of Lao American experiences. The theme is “Our Shared Journey: A Symposium On 40 Years Of The Lao In The United States.” This event is led by a partnership with the University of Minnesota’s Immigration History Research Center and the Lao American Writers Summit. Minnesota has the third largest Lao refugee population in the United States after California and Texas. An estimated 12,000 Lao are rebuilding their lives across Minnesota today. The state has been host to numerous events of historic importance to the Lao American community over the years, including the first National Lao American Writers Summit, the Legacies of War: Refugee Nation Twin Cities exhibit, Little Laos on the Prairie’s Refuge of the InvisibLao exhibit and many others. This year the SatJaDham Lao Literary Project is celebrating its 20th anniversary. The formal end of the Laotian Civil War was in 1975. The United States Central Intelligence Agency (CIA) under the pretext of the United States Agency for International Development (USAID), recruited and trained irregular paramilitary forces operating within the Royal Lao Armed Forces. Aerial campaign and carpet-bombing conducted by the United States resulted in more than two million tons of bombs dropped on Laos from 1964 to 1974, making Laos the most bombed country per capita in history. The conflict ultimately led to the displacement over 700,000 refugees around the world, including 400,000 resettled in the United States. During the course of the Symposium, noted scholars and community builders from across the U.S. will share their perspectives on the Lao journey and how the culture has changed over the years, and what it has preserved. The keynote speaker is Dr. Phitsamay Sychitkokhong Uy, an Assistant Professor at the University of Massachusetts-Lowell. There will be significant discussions about the power and pitfalls of storytelling and contemporary efforts to tell the Lao American story, particularly in the digital age. The symposium will be held April 17-18th, 2015 at University of Minnesota’s Urban Research and Outreach Center (UROC) located at 2001 Plymouth Ave North, Minneapolis, MN 55411. It is free and open to the public, but space is limited and participants are asked to register at: http://z.umn.edu/Lao40. The symposium will include panels, workshops, performances and light food. There will be a public reception on Saturday, April 18th at Co Exhibitions located at 1101 Stinson Blvd NE #2, Minneapolis from 6 to 8 p.m.
Saengmany Ratsabout is the Program Coordinator of the Immigration History Research Center at the University of Minnesota.